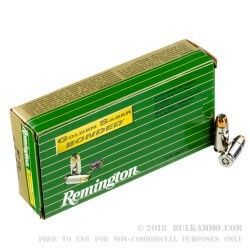 A bonded jacketed hollow point by Remington that offers premium ammunition benefits at a value price point. The Golden Saber bonded jacketed hollow point gives excellent weight retention on impact and ensures that the already excellent ballistics of the .357 Sig are able to enhance threat stoppage. The penetration of the round is exceptional and the velocity and impact energy is truly phenomenal making this a premium load at a very solid price point. 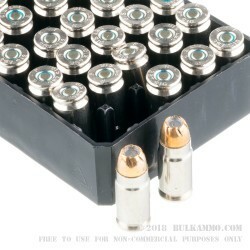 A 50 round box of nickel plated brass cartridges that utilize a Boxer primer to facilitate ease of reloading and keeps your gun functioning full-time. 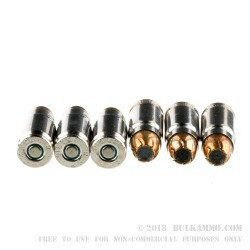 The feeding and ignition on these cartridges is second to none. The factory quality control specifications ensures only the best rounds in the world exit the production line and the bonded high weight retention bullet means you can rest easy that your threat will be stopped by this round should it ever have to be called upon for service. 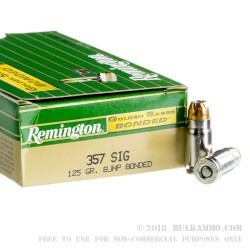 Superior accuracy, superior reliability and fast moving at 1350 fps, this .357 125 grain load is a great self defese cartridge and offers 500 ft. lbs. of energy at the muzzle.